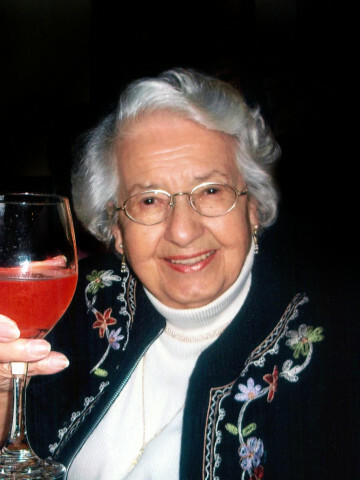 Edith L’Heureux Wisner, 90, of Hendersonville, TN passed away on Sunday, October 27, 2013 at home surrounded by her loving family. Edie was born October 28, 1922 to Omer and Amanda L’ Heureux in Upland, Nebraska. Edie was raised on a farm during the dust bowl and Depression. One of eight children, she knew the benefits of hard work; herding cattle, driving a tractor and learning how to make do with next to nothing. Her family still made time for fun playing Cheesix and hosting community hoedowns where her father played the fiddle and harmonica while her mother played the piano. Edie worked as a teacher’s aide to help pay her way through high school in Campbell, Nebraska. During WWII, Edie worked as a telegrapher for the Union Pacific Railroad in Caliente, NV where she met her future husband, Don Wisner. They married October 28, 1945, sharing their mutual birthday and now anniversary. In 1948, they moved to Milford, Utah where they raised their five children. Edie was very active in her children’s school activities and parish of St. Bridget’s Catholic Church. She loved to golf, play cards, garden, entertain and travel the world. In 1996, Edie moved to Hendersonville, Tennessee with her daughter, Michelle, and granddaughters, Sarah and Gabrielle. Later, she moved to Pennington Place Senior Living where she made many friends. Edie was a youthful and energetic woman involved in her neighborhood and Our Lady of the Lake Catholic Church. She devoted much of her time and energy to the Legion of Mary, Room in the Inn and Emmaus. Edie was a woman of substance and strong faith. She lived a life well lived. She is preceded in death by her husband, Charles Donald Wisner; infant son, Anthony Dean and adult son, Vince. She is survived by her brother Odell (Marilyn) L’Heureux; children, Michael (Penny) Wisner, Michelle (Mike Husky) Wisner, Nick (Young-A) Wisner, and Marianne (Judge) Gambill; 15 grandchildren, 17 great-grandchildren, and numerous beloved nieces and nephews. In lieu of flowers, the family requests donations be made to the Legion of Mary, in care of Our Lady of the Lake Catholic Church; 1729 Stop Thirty Road, Hendersonville, TN; 37075. Hendersonville Memory Gardens in charge of the arrangements. Aunt Edie will be greatly missed. She was a wonderful aunt as well as a great mother, grandmother, and great grandmother. Michelle, Marianne, Mike, and Nick, you and your families have my deepest sympathies.